wander / wonder: What is REALLY important to you? 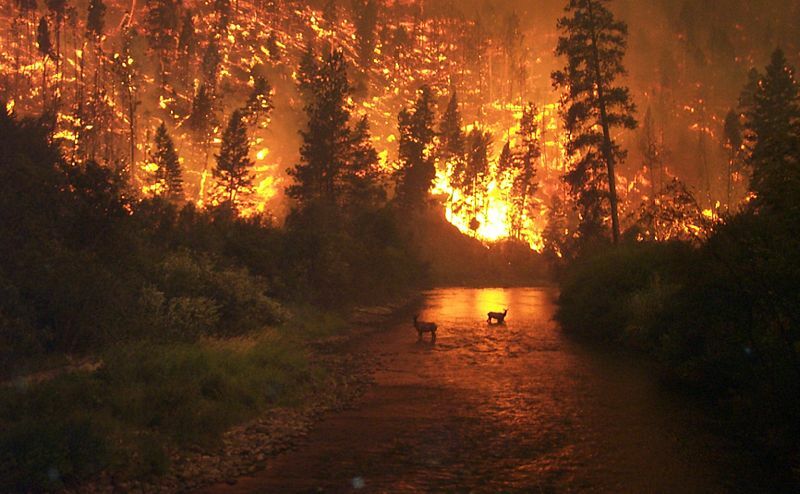 During the Wallow Fire, once I knew my family was safe, I worried about the animals. I worried about the smoke affecting them. I worried about the stress for them. My dad was pretty sure the fire wouldn't get that close, but I was still worried. It is our human nature to worry, isn't it? Even when we should trust God in everything. Trusting is not my strong point. Is it really anyone's? We worry about tomorrow; what will happen. We worry about the economy. We worry about the fires, and floods. We worry about our loved ones; we worry about those in our families losing jobs. We even worry about what others think about us. Worrying is not wrong. Sometimes it is the Lords way of reminding us to pray! It is not wrong to worry and pray about our lost loved ones. According to the Bible, there is nothing wrong with realistically acknowledging and trying to deal with the identifiable problems of life. To ignore danger is foolish and wrong. But it is also wrong, as well as unhealthy, to be immobilized by excessive worry. Such worry must be committed to prayer to God, who can release us from paralyzing fear or anxiety, and free us to deal realistically with the needs and welfare both of others and of ourselves. Also, many people are worried and anxious about events that will never actually will happen to them. We need to relax and focus on today. Take life one day at a time. Out of curiosity, how did you find my blog? Worrying less about the unimportant things of life is always something that I have to steadily work upon. Great post. It was very encouraging and helpful. P.S. I'm glad the fires are out. Are you and your family okay? This is great. I didn’t know about the fires over there but being Australian I certainly know how worrying bush fires can be. In February 2009 Victoria suffered its hottest day on record with temps up near 50C. The wind was blowing a ferocious gale and the atmosphere was very dry. It was on this day (known now as Black Saturday) that huge bush fires ripped across the state killing 173 people, by far the highest death toll for bush fires in Australia ever. Whole towns where completely burnt to the ground. Fortunately all our friends and family were able to escape the fires but many other people were completely trapped. Anyway I certainly know how worrying fires can be. Worrying is so natural for everyone. I know we will all worry. But I tend to think that worry is a sin....Jesus says, "Be anxious in nothing". Hmm....this is something we should all pray about. Because I know to be concerned about something, like our animals, or our loved ones, or even our finances, is natural....but I think to worry, ponder, and try to figure out all the 'what if's' maybe what is the sin in it. We have to learn to trust the Lord and accept His will....be it, in our eyes, good or bad. That picture of that fire is terrifying! I'm sure many animals in the woods suffered. 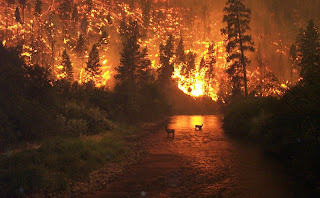 :( But I'm very glad your animals are all safe! That would have really, really worried me too! Thanks for the wonderful post! It made me think! The Lord bless you and yours! The time of the Wallow Fire. Whats that? Dan God op hem legt. Als vrees voor allerlei gevaar. You can translate it, haha! But I like your posting! It touched me. I liked how you tied this all together. I'm not much of a worrier. More of a dweller. Dwelling on things I can't change. But, I know my focus would be best spent elsewhere! I agree with what you said April. I'm one of those kinds who will find almost anything to worry about:) But I tend to find life a lot more peaceful and a whole lot less worrying when I am having a closer walk with the Lord. I guess I think its worry without trust that is wrong. If you are concerned about something and it stirs you up to pray then I think we can praise the Lord for stirring us. But I for one know how low you can be brought by worrying without trusting. You asked about the cbox. You can go here: http://www.cbox.ws/. However, to get the "smiles" that I have, you'll need to copy and paste those onto your computer, save them into Photobucket, then add the direct link code to your cbox account. I try not to worry...there are so many things going on in the now that stressing about what might be could just be overwhelming. I just figure that trusting in the Lord to make it all come out right is the best way to go.